Today our live-commentator is Simon Williams. 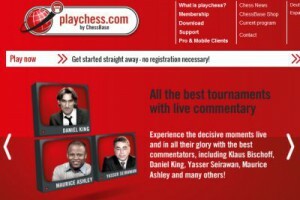 In cooperation with ChessBase you can follow the live-commetary with a free guest account on “Playchess.com”. This entry was posted in Allgemein on 14. June 2015 by mcadmin. 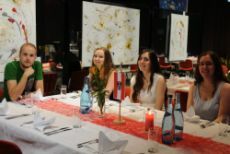 The Mitropacup started yesterday on the arrival day with a “Welcome Dinner” in the evening and the captains meeting. Kurt Jungwirth mentioned the history of the Mitropacup that was invented from Austrian Chess Federation. The first Mitropacup was held 1975 in Innsbruck, Tirol. This year the Mitropacup came back to Tirol. The 34th Event is held in Mayrhofen/Zillertal. We show you some impressions fromt the arrival day in our photogalery. We are happy to announce our cooperation with ChessBase. For the first time the Mitropacup will be commented live on the ChessBase Server playchess.com. All commentaries will be in English. Furthermore Daniel King will make a summary of each round on the following day. This entry was posted in Allgemein on 11. June 2015 by mcadmin. 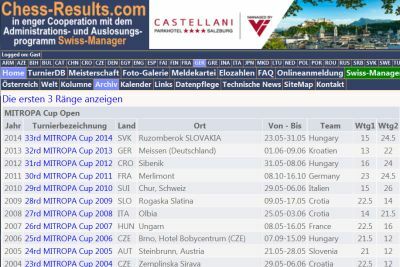 Thanks to our volunteer Austrian Chess Federation published the results from all Mitropacup tournaments since 1976 on Chess-Results. Furthermore we created an Excel-Sheet with some statistics for download and made a database in PGN with all games available. Today was the deadline for the registration of the team compositions. 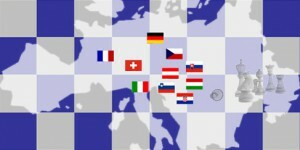 All the federations have send their registrations in time and the chief arbiter Manfred Mussnig has published already the teams on Chess-Results. Notice that France could not nominate a team in the women section. Austria will replace them with a second team. This entry was posted in Allgemein on 31. May 2015 by mcadmin. The registration deadline for the team compositions is the 31st May 2015. We kindly ask the federations to use the registration form and send it with mail to office@chess.at. Our chief arbiter Manfred Mussnig will publish the team compositions on Chess-Results immediately after this deadline or earlier, if we get the registrations from all federations. This entry was posted in Allgemein on 12. May 2015 by mcadmin. welcome to the Mitropacup 2015. The Event will take place in the Congress Centre from Mayrhofen Zillertal (Austria) from 14th to 22nd June 2015. We are happy that all ten Mitropacup Federations will participate. All games will be broadcasted live in the Internet. Results and games will be published on Chess-Results immediately after each round. Furthermore we will offer photo-galeries during the tournament. We hope that the chess family enjoys our services from the Mitropacup 2015. This entry was posted in Allgemein on 8. May 2015 by mcadmin.